Oh hey, Overwatch has a London map. You can tell it's a London map because it has a red phone box and double-decker bus—the two things that they have in London. 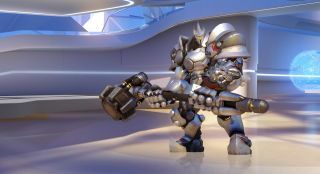 Overwatch also has a big guy with a big hammer. He's called Reinhardt, and he's the tank of the team. He's mostly melee, albeit with an additional ranged flame strike that's available on a cooldown. Other abilities include a shield, a rocket powered charge attack that can smash enemies into walls, and an ultimate that knocks down enemies by creating shockwaves along the ground. Overwatch is planned for an open beta release this autumn.